I am in Barcelona today until later then I am off to Valencia for two days. More on the Spanish tour later. The latest edition of the ECB’s Economic Bulletin released on May 5, 2016 carried and – Update on economic and monetary developments – provides more evidence, as if any was needed, that the current reliance on monetary policy – standard or otherwise – to reboot the stagnant economies of Europe has failed and will continue to fail. Why? It is the wrong policy tool. Journalists are increasingly writing that policy options are exhausted because central bankers ‘have fired all their shots’ and the “more shots they fire, the less effective they become”. The implication is that the world is locked into a future of secular stagnation with elevated levels of unemployment and low productivity growth. They seem to have forgotten that fiscal policy remains effective if it is used properly. There is no secular stagnation – just irresponsible fiscal policy use. 2. “The soft patch in US activity appears to have continued into the first quarter of 2016”. 3. “In Japan, the growth momentum remains subdued”. 4. “In the United Kingdom, GDP growth is expected to moderate”. 5. “In China, available data remain consistent with a gradual slowdown in activity”. 6. “Growth momentum remains weak and heterogeneous across other EMEs”. 7. “Wage growth has remained relatively low in the euro area … Wage growth has not only been low, but also consistently over-predicted.” In other words, the austerity leads to growth rhetoric has consistently over sold the narrative that workers would enjoy a return to prosperity soon. 8. “The large remaining amount of slack is a key factor pulling wage inflation down”. So a pretty downcast outlook after 8 years of poor performance. The ECB also think that “inflation rates are likely to be negative in the coming months” ith some pick up later in the year. The ECB also tell us that “the largest sources of money creation in February were the bond purchases made by the Eurosystem in the context of the public sector purchase programme (PSPP)” – in other words, the central bank using its currency-issuing capacity to convert one financial asset (bonds) for another (cash deposit). You also have to appreciate these outcomes in the context of the ECBs current policy stance. It has been purchasing financial assets from the non-government sector at a volume of €60 billion a month, and from March 10, 2016, they upped this volume to €80 billion. It has been running ever increasing negative interest rates on the deposits that banks have with it (reserves). So if you start putting all this together you will conclude that mainstream economic theory which has been used as an authority to design policies that include fiscal austerity and these bizarre monetary policy gymnastics is not capable of prescribing a policy mix that will generate prosperity. We were told that fiscal austerity would bring growth as consumers and business firms, unshackled from the threat of future tax hikes ‘to pay for the deficits’ would jump out of their pessimism and spend up big. That hasn’t been happening. We were told the deficits would push interest rates up. They have come down and into negative territory in some cases. Japan is now borrowing over 10-year periods at negative rates – that is, investors are paying a fee to buy Japanese government debt. We were told that the deficits, and then the non-standard monetary policies (QE and its variants) would generate such growth in the supply of money around the world that inflation would quickly accelerate and possibly become hyper. None of that has happened, nor will it, and for good reason. 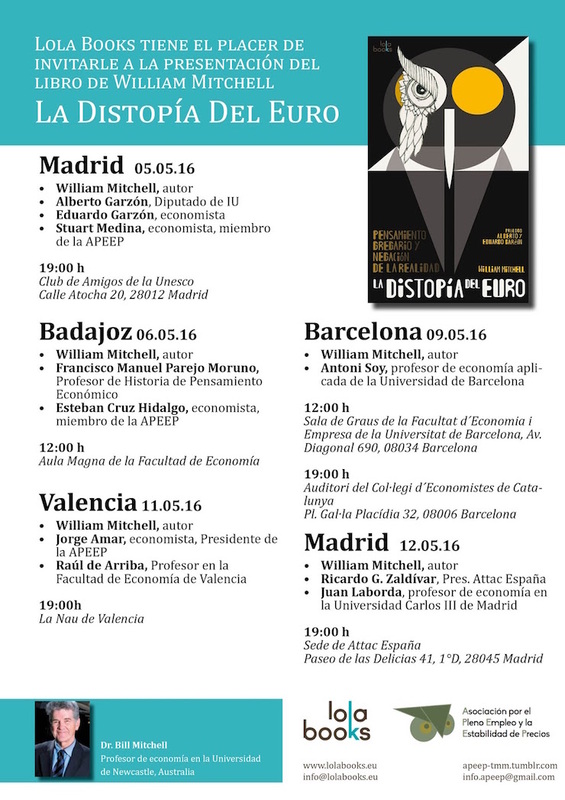 These predictions were based on a body of macroeconomic theory that has no correspondence to the real world. Its conception of the role of banks is flawed. It doesn’t understand that banks do not loan out reserves. It doesn’t understand that public deficits do not starve the economy of savings but, in fact, stimulates higher saving. It doesn’t understand that SPENDING = OUTPUT = INCOME which generates employment. You cannot have growth without spending. The ECB provide an interesting graph (Chart 2) which I replicate here (in part). If I had have produced the same graph and included the full employment decades of the 1960s and 1970s, a different picture again would have emerged, although the message would have been the same. Real output Growth was much stronger in the 1960s (and productivity growth likewise) and although the OPEC oil crises of the 1970s reduced average growth rates, the performance of the more recent decades has been inferior. And … it is no surprise why despite all the latest efforts by mainstream economists to massage the explanations to avoid the obvious. There simply has been a deficiency of spending in the more recent decades, mostly as a result of governments being pressured into adopting more austere fiscal positions than were warranted by the state of the real economies they were overseeing and the desires of the non-government sector to spend and save. 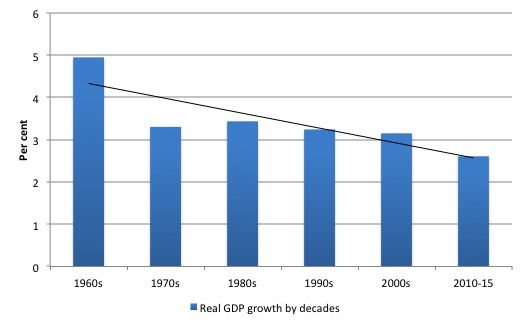 I have included a graph for Australia next – real GDP growth by decades – starting in the 1960s. Before our government became obsessed with chasing fiscal surpluses, real GDP growth was much stronger. In the 1960s, it averaged 4.95 per cent. Now it is lucky to 2.5 per cent and the trend is downward. There was an article published on the Australian Broadcasting Commission Op Ed pages yesterday (May 9, 2016) – Were the last 100 years of growth an aberration? – which tried to argue that perhaps the mature capitalist economy has entered a new phase of low growth. … been raising white flags almost everywhere. Across the globe, central bankers are quickly running out of ammunition in their quest to combat deflation. It is not that they have run out of ammunition. They have been using the wrong ‘ammunition’. For example, trying to drive growth with low or negative interest rates failed to work because the lack of bank lending had nothing to do with the ‘cost’ of loans. It had all to do with the dearth of borrowers. Households, carrying record levels of debt and facing the daily prospect of losing their jobs were not going to suddenly bingeing on credit again. Business firms, facing slack sales and a very uncertain future, could satisfay all the current (low) levels of aggregate spending in their economies with the existing capital stock they had in place and therefore had no reason to risk adding to that capital stock. There has been no reason to borrow. Further, the QE policies have just been pursuing a massive asset swap. One form of saving for another. The only way that the policy could have stimulated spending was if the lower long-term interest rates (driven by the elevated levels of demand for the bonds being bought) had stimulated investment expenditure. But go back a few paragraphs. The lack of borrowing was not the result of excessive loan costs. The ECB could have, for example, announced it would buy all the newly issued debt of the Member States if they increased their deficits and growth would have returned immediately – via the fiscal deficits. The European Commission could have turned a blind eye to their ridiculous fiscal rules (as they have done over the last 12 months with Spain – which now has a deficit of 5.2 per cent of GDP, well above the allowed 3 per cent under the Stability and Growth Pact). The central banks have plenty of ammunition. It is just that they have to use it in conjunction with or to support expansionary fiscal policy at times when non-government spending is not sufficient to drive real GDP growth at rates that will keep unemployment low. Claiming that the central banks have run out of policy capacity is just code for saying that nations should operate with one hand tied behind their backs – that is, not use fiscal policy in a responsible and appropriate way – to fill spending gaps created by the non-government sector not spending all of its income in any particular period. … global forces that conspire to push the deficit deeper into the red and see our debt problems escalate into the future. If the ECB is correct about its evaluation of current trends and the pessimistic outlook for the world economy, then Australian exports will decline somewhat. That is almost assured. But net exports do not currently contribute to growth because the net income transfers on the current account and imports exceed exports. So these ‘global forces’ can reduce our growth if nothing else is done. But as China proved in 2009 when its export income fell sharply, domestic growth can be maintained with a shift to domestic demand – via rising fiscal deficits. The journalist is correct in one thing – the deficits will probably have to rise. But our government is not helpless in that regard. 1. Continue to cut the discretionary component of the fiscal balance (that is, pursue austerity – albeit a rather mild version of it at present) and the combination of the fiscal drag domestically and the declining prospects externally will drive the overall fiscal balance further into deficit, even if the structural component declines through austerity. The rising deficit, in this case, will be associated with falling real GDP growth and rising unemployment. 2. Recognise that the world outlook is negative or at best static, and use its fiscal capacity to take responsibility for supporting economic growth by increasing the discretionary fiscal deficit – probably by around 1.5 to 2 per cent of GDP. The rising deficit, in this case, will be associated with increasing real GDP growth and falling unemployment – a virtuous conjunction of events. The journalists claim that either option would lead to an escalation of our public debt problems in the future is moronic. The Australian government can always service any liabilities it issues in its own currency and can also control interest rates if it chooses through the Reserve Bank of Australia. Economists now are beginning to question whether the past century of economic growth was an aberration. After all, there was no such thing as economic growth prior to the industrial revolution. Which is where the reader should click to another page. I am an economist and I am not questioning anything of the sort. It is clear why the graphs above are like they are. The decline in growth in recent decades reflects the ideological shift that started with the Monetarist penetration into the policy making circles. This ideological shift eschewed the use of fiscal deficits and introduce prolonged ‘fiscal drag’ into the advanced economies (more so in some than others). Growth then was largely driven by private sector credit expansion which has had rather marked balance sheet effects. The suppression of real wages growth relative to labour productivity growth also meant that household consumption growth was increasingly dependent on credit growth over the last few decades. The GFC demonstrated what a toxic mix this has been. Ultimately, economies can only grow for a finite period with this sort of combination in the mix of total spending between the government and non-government sectors. Once the private balance sheets become too precarious, small parametric changes in interest rates, levels of economic activity etc can spark a major crisis. The GFC was the culmination of the time bomb that started back in the 1980s under the neo-liberal myth that self-regulating, free markets would generate untold financial wealth for us all. The journalist rehearses the argument that the growth phase for the world is over and stagnation awaits which “poses problems”. For growth has helped the world solve two major problems. First, it has allowed governments to resist raising taxes to fund ever more demands for services. Second, it has mitigated tension between socio-economic classes. If everyone’s wealth is rising, there is less likely to be conflict between rich and poor even when the wealth gap is widening. I agree with the second claim about distributional conflict. But the first claim is erroneous for two reasons. First, on historical grounds, the world monetary systems shifted dramatically in the early 1970s when President Nixon suspended gold convertibility (for the US dollar) and the Bretton Woods fixed exchange rate system came to an end. Prior to that governments were constrained by the central bank’s need to maintain the exchange rate and government spending would have to be matched by taxation or debt-issuance to ensure that the central bank could keep some hold on the volume of currency circulating in the system. After that point, sovereign governments were never revenue constrained if they assumed the role of monopoly issuer of the currency, which most did. So there was no inevitability that taxes would have to rise to ‘fund’ anything. The role of taxes in a fiat currency system is not to ‘fund’ government spending but rather to create real resource space so that governments can spend without creating inflation. They play other roles (shifting resource allocation away from bads (for example, tobacco) and redistribution) but unless the government can deprive the non-government sector of use of the available real resources in the nation, there is no space available for non-inflationary government spending. The journalist later on claims that the policy priority in Australia is for the government to reduce spending and raise taxes. Eventually, we will need to pay more, or close off more of the loopholes, to balance the books. Historically, the Australian government, like most governments, has never ‘balanced the books’. What imperative is there to do so? None. Other than the ideological ones that is! Government deficit (surplus) = $ for $ = Non-government surplus (deficit). If the non-government sector desires to spending less than its overall income (that is, run a surplus or save overall) then the income shifts will ensure the government is in deficit. If the government is intent on running a surplus and implements discretionary policy changes to facilitate that (austerity) then if the non-government sector continues to desire to save overall, the result will be recession. The non-government sector desires will see it spend less than it earns and unless that spending gap (relative to current levels of income) is filled by government deficits, the firms will reduce output and scale back employment. A vicious cycle then transpires. In any monetary system, that fundamental relationship ALWAYS holds. It cannot be violated. Historically, the non-government sector has desired to save overall and this has led to the government running continuous deficits of varying magnitudes to support that desire and maintain growth. The two decades or so before the GFC were an extraordinary period. 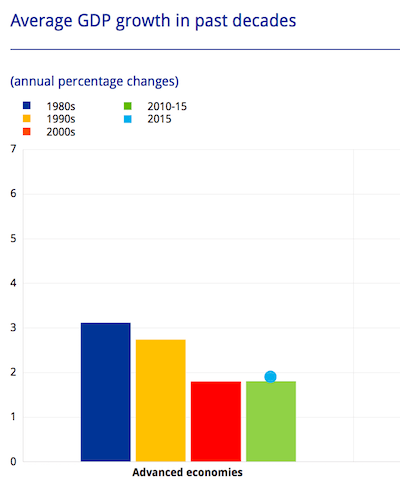 Australia ran fiscal surpluses from 1996 to 2007 (bar one year) and they were only possible because the non-government sector (principally households) ran up record levels of debt. The household saving ratio, which historically has averaged between 10 and 16 per cent of disposable income, fell into negative levels during this atypical (abnormal) period. There has never been a time when the federal government has systematically ‘balanced its books’. That is just neo-liberal fantasy. The article continues to deteriorate after that. First, until we stop relying on monetary policy and restore fiscal policy to top of the macroeconomic policy hierarchy, nothing much is going to change. Second, the so-called ‘Law of Diminishing Returns’ (in this context, allegedly constraining any future productivity growth) is irrelevant when considering whether fiscal policy could restore and sustain full employment. Continually accelerating growth should not be the aim. The aim should be to have sustainable steady growth at rates sufficient to provide jobs for all. If we move towards a more sophisticated definition of what constitutes meaningful work, then it is clear we can have lower real GDP growth rates but still provide meaningful and productive employment for all that desire it. The public sector is going to have to become more involved in that sort of employment generation – sophisticated personal and environmental care services, for example. The ‘shots’ that the central bankers fire were never going to be effective. Monetary policy is a poor tool for stimulating aggregate spending. The fact that the journalist is now expressing surprise that the monetary policy interventions have not worked goes to show he didn’t understand any of that in the first place. No-one who understands how the monetary and banking systems actually operate would have predicted anything different. It is a sad state of affairs as Australia heads to the next election on July 2. The economic debate is conducted on such false premises that no meaningful progress can be made. We have the ruling conservatives wheeling out their usual nonsense. The party of the workers (allegedly), aka The Labor Party trying to demonstrate their fiscal responsibility by claiming they would run bigger surpluses and get back in to them more quickly than the conservatives. And the Greens, the neo-liberals on bikes, basically riding those bikes into oblivion. The more one travels though – the more it is apparent that it is the same the world over. We are locked for the time being in a very dark age. Who would have thought that the master of the one line sound bite would be Donald Trump. his is the United States government. First of all, you never have to default because you print the money. I hate to tell you. So there’s never a default. This article – Donald Trump on the debt: “You never have to default because you print the money” – ties all this in with Modern Monetary Theory (MMT). Other politicians and prospective politicians should take heed! I have interviews in Barcelona today and then we are off to Valencia later for two presentations there on Wednesday. I think it’s pretty clear now that having failed to lend people money to buy stuff, there is now a push to give people money to buy stuff – all without involving the elected government which has to be encased in concrete boots and a strait jacket lest it moderate the free market with democracy. That’s the real reason that fiscal policy has to be kept in a sealed vault. If a set of people in power rediscover the secret, then who knows how much fairer and equal society would be. And that would never do. We’re back to Kalecki again. I particularly like this part of the final sentence, which reads, “..we may well need, in the years ahead, to think about how we manage an economy in which the zero nominal interest rate is a chronic and systemic inhibitor of economic activity..”. Er – yes: unbeknown to Larry the Ignorant, MMTers and indeed Keynesians in general worked out long ago how to boost demand in a zero interest rate environment. But we can’t expect Larry the Ignorant, who campaigned for abolishing bank regulations just before the 2007 bank crisis, to actually know anything about economics. Trump is more of a progressive than Killory and not nearly as bloodthirsty. It is time that we discuss some of the things Trump is suggesting. The TTP vote should be delayed until after the election. The sad part is, when the neoliberal ship of fools runs aground, and it certainly appears it will, they will blame the failure of their belief system on everything from MMT to the Zika virus. There is no reasoning with socio-pathic ideologues. Damn, an other Spaniard named Ignacio here… I post sometimes over here (and in Mike Norman blog, other MMT-friendly place), wasn’t in the presentation but I can believe that. I’m “excited” with the conversations with the IU leadership, I know R.Wray had also some encoutners with them. I may even vote IU in the upcoming elections knowing they are aware and sympathetic to MMT and know about euro problems. Which is a primers, as I’ve had never voted a “radical left” party in my life (didn’t vote on the last elections in December). Hoping to see some youtube videos or your impressions over your trip to Spain in the blog soon! If you look at Trump’s entire statement from yesterday he is under the impression that, although debt itself is not a burden because the US government can ‘print the money’, he seems to be under the impression that the interest on the debt is a serious burden that he might have to renegotiate with creditors. Furthermore, he thinks that renegotiating interest rates on the debt is like refinancing a mortgage, i.e. something a government should routinely do to take advantage of lower rates. He doesn’t seem to understand that this would still constitute a default. He also made these comments in an attempt to clarify his early comments that the US should just default on its debt if the economy crashes. I think it’s clear that he is lying and his initial comment about defaulting in the event of a crash is what he really believes should be done. I think this because he says he was ‘really’ talking about taking advantage of lower rates in the future even though we are currently living in an age or rock-bottom and even negative interest rates. The bottom line is that Trump can’t be trusted. Today he may understand (partially) that the US government ‘prints the money’ but tomorrow he might believe the exact opposite. Further reading about Trump’s comments shows that he is talking about buying debt at a discount if interest rates go up in the future, not down. So I think what he must be talking about is buying up discounted US debt in the secondary market, not renegotiating the terms of the debt. Not as bad as it first sounded, but still entirely unnecessary from an MMT perspective and likely recessionary since it would be Treasury buying up these bonds as part of a budget surplus. IIRC as a foreign secretary Hillary Clinton went to China and begged them to continue to fund US budget deficits. What does that say about Hillary? He’s everything to nearly everyone and a compendium of the madness of our times. It is obvious to me (and I am sure to many of your other followers) that you are probably one of the busiest economists on earth with the blogs and your university duties etc. Also you want us to spread the word – which I do at every available opportunity. However why don’t you, Randy Wray and Stephanie Kelton run a MOOC (Mass Online Open Course) on MMT? Perry Mehrling did his first one on Money and Banking in mid 2013 through INET. He had somewhere in the order of 32,000 students. I did it and really enjoyed it. I think you would be pleasantly surprised at the numbers who like me would love to do it. Come on Bill that will spread the word? Nice summary article. Interesting comment about [Australian] Greens – are “neo-liberals on bikes”. Do you hold that view for UK Greens? I left the UK Labour 4 years ago, due to Blair’s neoliberal entrenchment, for the Greens as my only remaining option. I see some good signs in [UK] Green economic policy, although the average Greenie has little knowledge of MMT, but many mutter – do you mean “Positive Money”? After a few years of reading your blog I still feel a little like Fredrick Soddy, where I see the thermodynamics of capitalist economics as a system not in control, its leaky (entropy decreases). A reference to assist my understanding how debt does not go exponential on continuous application of fiscal policy. Excuse my naivety, I’m not an economist but an interested student. One person’s default is another person’s 20% tax on foreign dollar savers. It doesn’t matter a fig if the USA ‘defaults’ any more than it matters if they have a AAA rating from the rating agencies. All it upsets is people creating a paradox of thrift by saving and expecting to get paid for it. Let them be upset. There are plenty of people not eating because of worries over entries in computers, and we really should be putting feeding the population ahead of misers counting their winnings. Then you must be squinting very hard. They have a citizens income in there – aka less money for the poor for more tax for the rest of us. They want to turn over the entire money system to an unelected quango. And they love the EU – which is a neoliberal corporate hellhole – because it represents their dream of a world without borders. Clearly they want to abolish the power of democratic representative government in favour of ‘rule by betters’ – which is what ‘aristocracy’ means btw. Politicians have to have ‘oversight’ you see from people who aren’t elected and know what the proles actually need. The stupid proles can’t be expected to elect sensible people – look at Trump. The UK Greens are neo-socialist/cultural marxist in outlook and won’t get anywhere. UK Labour is torn between a group that really want to be Greens and a group that really want to be Tories. What we need is a group within UK labour that is more like Sanders group in the US – but there is no sign such a group exists. So the analysis of Japanease twenty year stagnation is irresponsible fiscal policy? levels of fiscal stimulus relative to GDP in the same time. in our mass consumer society needs even more fundamental change . There is no ideal solution to the inevitable conflict of animals’ desires. That would be when THE Ugly American agrees with your somewhat unique perspective of how things work, debt and money-wise. Agreed it sounds downright MMT-ish. But, since money is not issued into circulation by its ‘printing’, and since the governments of all modern monetary economies have given up the power granted them by their sovereignty to actually issue their nation’s money into circulation, even digitally, well, doesn’t that actually leave us with no means to pay off any of the national debt without resort to ….. ummmmm, more borrowing or more taxation? Neo-socialist/cultural marxist seems irreconcilable. Neo-socialist evolved into national socialist, and national socialist gladly use the culture marxist invective upon all left. Culture marxist is a fairly new right wing invention, a conspiracy theory and an invective aimed at pretty much all criticism that they identified as coming from left. Don’t know about UK Greens, but aren’t they as greens in other countries, neo-liberals on bikes as Bill puts it? money is two things at the same time. Asset to the creditor and debt to the debtor. More you pay government debt off, poorer the private sector gets. We don’t want that to happen, do we? I’ll assume that by debt we’re talking about government bonds. Depends what you mean by “given up”. They all still have that power*, they just don’t use it, much. The figure usually quoted is that 97% of money is created by banks, but that still leaves 3%. No. Governments could pay off that debt – not that there’s any need to – in one hit by swapping it for reserves or lovely crisp notes. More QE, with some tweaks. They could also, more sensibly, stop issuing new debt and pay the existing debt off over time, as it comes due. No changes to the money creation powers that have been “given up” need come into play. Ok, it makes perfect sense to me that a sovereign government should never have to directly worry about the size of any “deficit” or debt in its own currency – but to what degree is a typical modern nations’s national debt due to borrowings in other currencies, that we can’t issue? E.g. surely the Australian federal government holds some amount of USD debt, that in a worst case scenario it could default on, if nobody was prepared to exchange the necessary amount of AUD for USD? While it’s hard to see such a situation arising between us and the US, there must be other countries who really do have debts that are going to be difficult if not impossible for them to service if their own currencies become worthless relative to those that their debts are in? My other question is that surely those responsible for determining the size of the government’s budget each year (including the Treasurer?) must *know* that financially it doesn’t really matter if they spend more than they “collect” in taxes? They’re certainly well aware it matters politically, of course, which is arguably just as important.